Add some sparkle! 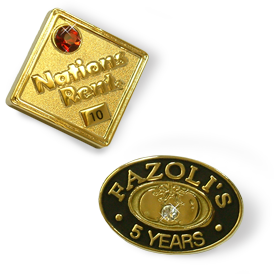 Gemstones can be added to any lapel pin or metal item to give it some extra shine. Different types of gemstones are available in many colors and sizes. A brief selection of available types, colors and sizes of gemstones are listed. For additional information or specifications please call for pricing and details. 2-point cut crystal diamonds, rubies, sapphires or emeralds add .38 (A) per gem. 2-point synthetic diamonds, rubies, sapphires or emeralds add 1.50 (C) per gemstone. Diamonds - 2-pt genuine, premium quality 53.00 (C) per diamond. Sapphire - 2-pt genuine, premium quality 12.00 (C) per stone. Ruby - 2-pt genuine, premium quality 14.00 (C) per stone. Emerald - 2-pt genuine, premium quality 16.00 (C) per stone. See page 6 of our 2015 catalog for a convenient point size chart. Add 5 days to standard delivery times.